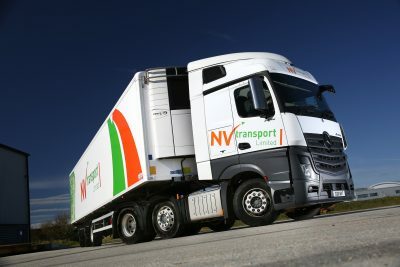 Asset Alliance Group has strengthened its ties with NV Transport after supplying the haulage company with four refrigerated Longer Semi-Trailers (LSTs) – believed to be the first of their kind to operate in southern England. The extra-long reefers have been provided on a seven-year full-service contract hire agreement and join the Chichester-based fruit and vegetable distributor’s 60-strong fleet of trailers, two thirds of which are supplied by Asset Alliance Group. 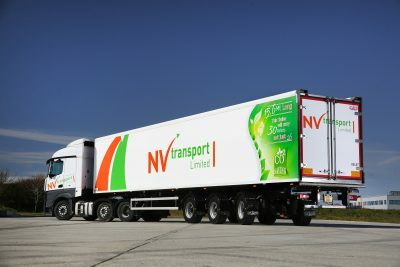 NV Transport Managing Director Steven Zwinkels was keen to take on the four refrigerated LSTs, built by UK manufacturer Gray & Adams, to enhance efficiency and ensure fresh produce can be delivered as quickly as possible to customers including Lidl, M&S, Morrisons, Sainsbury’s, Tesco and Waitrose. He says: “Supermarkets are pushing for environmental efficiencies, so these trailers are highly appealing to our customers. They allow us to load a lot more pallets, which means we’re getting more out of each chilled produce delivery. Under the seven-year agreement, Asset Alliance will retain ownership of the 15.65m trailers and will shoulder the associated operational costs including servicing, maintenance and repair requirements, tyre replacements, breakdown cover and safety inspections. Zwinkels said NV Transport’s excellent long-standing relationship with Asset Alliance Group made the independent commercial vehicle specialists the obvious choice to fund its four refrigerated LSTs. He explains: “Everything will be fully maintained – tyres, fridges, the whole lot – and it’s a fixed cost for the entire term which is so important for planning. Asset Alliance Group has redefined the way companies acquire commercial vehicles and occupies a unique position in the market, as it uses its own funds and significant buying power to supply multi-brand vehicles on any combination of contract hire, operating lease, finance lease or hire purchase. This flexibility, combined with a transparent and consultative approach, helps customers drive maximum efficiency from their fleets. Asset Alliance Group also stands out for maintaining full control of residual risk through its retail arm, which protects customers from overly strict return conditions commonplace in the industry. Its modern workshop facilities also keep end-of-life costs to a minimum and provide the opportunity to refurbish vehicles in-house for an additional life in service.